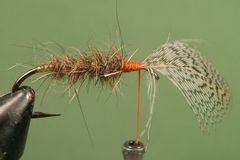 This little soft hackle wet fly, created by Sylvester Nemes, is one of several trout flies that work very will for taking Bluegills and other panfish. 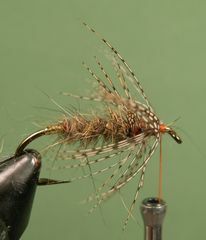 The March Brown Spider is one of my favorite soft hackles for taking Spring Creek trout in Northeast Iowa. It's also a great wet fly for panfish. 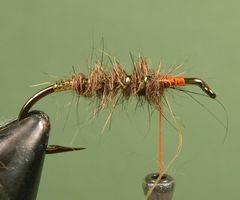 The March Brown is a very simple fly to tie. 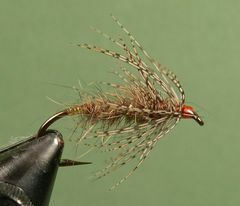 Tie in the gold mylar tinsel tag on the rear of the fly, dub the body with Hare's Mask fur, tie in and palmer the hackle, form a neat thread head, and you're finished. If you don't have a Hare's Mask, to provide dubbing fur, you can substitute Hairline's Hare's Ear Plus (tan - #7). The method for palmering the hackle is unique, as you will see in steps 6 through 9. 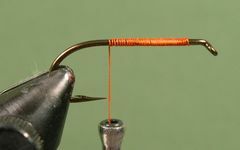 This method spreads out the hackle barbs over the last quarter of the hook's shank instead of having the hackle all bunched up at the front of the fly. I have fished this little guy three ways - by itself, as a dropper off a streamer, and as a dropper off a topwater fly like a small hair bug or popper. And, they are all effective ways to take bluegills and small bass. 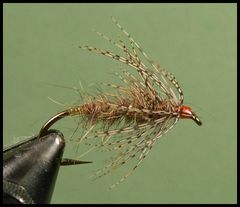 Whether you are fishing the March Brown Spider by itself or as a dropper be sure to use the smallest tippet possible. The finer the tippet the better the fly sinks and swims. I always attach the March Brown Spider to the tippet material with a Uni-Knot or a Nonslip Mono Loop. If you're not familiar with these knots click on "Tying Warmwater Knots." If you're fishing the March Brown as a dropper, use about 18 inches of fine tippet material to attach the dropper to the point fly. Tie the fly to the tippet with a Uni-Knot and the tippet to the point fly's hook bend with an Improved Clinch Knot. Clamp the hook in the vice, crimp the barb, and attach the thread. Lay down a base of thread from the hook's eye back to the hook's point. Tie in the gold Mylar Tinsel at the hook's point and bind it down back to the hook's bend. Return the thread to the hook's point. Wrap the Mylar Tinsel back to the hook's point and tie it off with a couple wraps of thread. Leave the remainder of the Mylar to form the rib in a later step. Apply Hare's Mask fur to the thread and form a dubbed body to about the three-quarter mark on the hook's shank. Take one turn of dubbing behind the tinsel and the remainder of turns in front. Spiraal the Mylar Tinsel forward to the dubbing break with fairly wide wraps. Tie off and remove the excess tinsel. 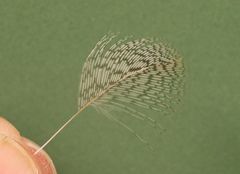 Select and prepare an appropriate feather from a partridge skin. Move the thread to about an eye width behind the hook's eye and tie in the Partridge feather by the stem with thread wraps back to the dubbing break. Clip any excess stem. At this point you have a decision to make. You can either dub a thorax with dubbing, as I'm doing here, or you can leave the orange thread as the thorax and simply wrap the hackle over it. It's your choice. 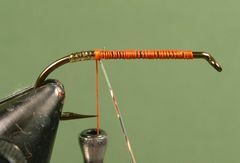 If you want orange to show through the wrapped hackle, omit this step. In either case, the hanging thread should be left at the dubbing break for the next step. Grasp the tip of the Partridge feather with your hackle pliers and wrap it back to the hanging thread. Tie off the feather and remove any excess. Wiggle the thread through the hackle as you return the thread to the front of the hook to form the head. 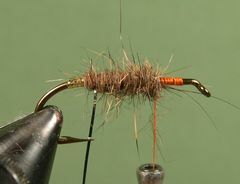 Try not to bind down any of the hackle as you return the thread. Form a neat thread head and tie off with a couple of half-hitches or a whip finish. Coat the head with head cement. Your March Brown Spider is finished.